Being a mum of three children close together in age, I’ve always been conscious at how little opportunity I get to spend one-to-one time with each of them. But on Saturday afternoon, with his big brother and sister both at birthday parties, I had a lovely trip with just my four year old youngest child to The Red Dragon Centre. We were there as part of our role as family blogger ambassadors for the centre to watch The Lego Movie 2: The Second Part at the ODEON cinema. It’s the follow-up to the 2014 box office hit The Lego Movie which is a huge favourite of all three of my children but in particular with my youngest who is Lego-obsessed. He has been so excited about the new film and has been counting down the days to its release. I’m pleased to report that it was worth the wait as we both absolutely loved it. Before the film started we spent an hour or so making Lego creations at the Lego make station hosted by Cardiff-based The Kids Construction Company. They were at the centre for one day only to celebrate the launch of the film with visitors encouraged to use their imaginations for the chance to win Lego Movie 2-themed goodies. My youngest has always loved making up his own Lego makes and had great fun using his imagination to create a ‘police space flying car’. We also made sure to visit the Lego Movie cut out which makes for such great photos. It also features a child-size Emmet which my littlest was so excited to see and couldn’t stop hugging. But back to the film. The Lego Movie 2 is set five years on from the first film and it’s just as witty and creative, working on different levels for children and grown-ups. Bricksburg has become Apocalypseburg thanks to Duplo invaders while in the real world Finn’s younger sister Bianca has started stealing his Lego sets and combining them with her own. Cheerful good guy Emmet is the only Lego person i Bricksburg to remain upbeat… although even he is troubled by dreams of “Our-Mom-Ageddon” – real world threats that if the siblings don’t stop arguing over the Lego it will all be confiscated. In ‘the Systar System’ superheroes have had a glitter makeover and are living in suburbia and Batman is getting ready to marry Queen Watevra Wa’Nabi, the regal shape-shifter who has the ability to transform herself into anything she wants. 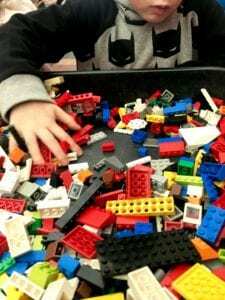 My youngest loved all the Lego creations and adventure; I loved the underlying story of the real-world siblings arguing but eventually finding a way to play together. It all got quite emotional towards the end. We both loved all the songs. Everything Is Awesome from the first film makes a reappearance and Batman has a musical number referencing all the actors who have played the superhero which was completely lost on the youngsters but had the grown-ups chuckling. However it is Catchy Song with its refrain of “This song is gonna get stuck inside your head” that will indeed get stuck inside your head. Needless to say we have been singing it ever since! Have you seen The Lego Movie 2 yet? Do let us know what you thought.